After the excitement of attempts to delay my round 9 chemotherapy, round 10 was back to the same old, mundane, uneventfulness, which is good. There was the usual Monday morning routine; dropping my daughter at school, staying for assembly and then meeting Jenni at home for the trip into hospital. There was something a little bit different that morning, however. I woke feeling nauseated. Not a good start feeling sick before the chemo has even been infused. I’d eaten prawns the night before, which is probably not a wise thing to eat when you’re supposed to be on a ‘neutropaenic diet’, but I figured I wasn’t really neutropaenic anymore thanks to the G-CSF injections. I texted everyone else who’d eaten prawns to see if they felt sick too. Nope, just me. The possibility of anticipatory nausea crossed my mind. I wasn’t convinced that’s what it was as I didn’t really think nausea and vomiting had been a huge problem for me, and I hadn’t even hit the treatment room yet. But it was possible. I have learned how powerful the brain is. When I had my initial CT scan, I saw what I thought were lymph nodes the size of golf balls in my neck on the screen in the CT room. After that, my neck felt very full. Then when I saw the haematologist, who made me feel like I just had a cold, my neck felt normal again. The biggest lymph node in my neck was only about 2 cm, which is a decent size for a lymph node, but certainly not golf ball size. In hindsight, I think the reason I thought I saw golf balls was because the whole image was enlarged! So my brain was also the size of a large watermelon. Perhaps I wasn’t thinking clearly that day. So, off to hospital we went. First stop was the day infusion ward for a blood test. I mentioned the nausea to the nurse and she also raised the possibility of anticipatory nausea. I then went upstairs to see my haematologist. Despite not feeling great, I was smiling when I entered his room. He asked why I was smiling. Was it because I could see the end? I think it was. He also asked me what treatment number I was up to. I said, “Number 10 of you’re me, day 15 of cycle 5 if you’re my doctor”. I also told him about the nausea and asked if it could be anticipatory. He smiled and said “maybe” which I’m sure means that’s what he thought it was. He asked about my mouth again, and if I was getting ulcers. I asked him if I should be expecting them at this point in treatment but he said probably not because they are associated with neutropaenia and the G-CSF was taking care of that. I asked him that day about whether I should expect long term heart and lung problems as they can occur with the chemo drugs I was having. Bleomycin can cause pulmonary fibrosis, organising pneumonia and hypersensitivity pneumonitis. Adriamycin can cause cardiomyopathy, which can be fatal, but is generally dose related (so I should be OK if I don’t have too much). The reason I was asking these questions was because at a previous appointment with him, he seemed to think me doing this 60 km walk in March wasn’t such a great idea, which surprised me. I wanted to know why he thought that (other than the fact I would have finished chemo only two months before and hadn’t done any exercise for months, of course). Was it because I should be expecting long term heart and lung problems? He told me I was young and healthy (except for the cancer bit) and that the treatment for Hodgkin’s was usually well tolerated in young, healthy people. So, I guess that was a no. I didn’t ask him specifically about the walk that day because I didn’t want him to tell me not to do it (I’ll broach that subject again closer to the time). It’s a bit like drinking alcohol; I have had the occasional glass of wine towards the end of the second week of my chemo cycle when I’m feeling relatively well. People ask me if I’m allowed to drink alcohol. I assume the odd glass is OK but I haven’t asked him just in case he says no. I asked him why he hadn’t done any baseline heart and lung function tests prior to chemotherapy, as these are often done to ensure the function is normal prior to starting treatment with drugs which can cause damage. He said he does baseline tests less often these days and basically because I’m young and “healthy”, they were bound to be normal. Yeah, a bit like that bone marrow biopsy, you know, the one that took three goes at drilling into my hip to get the trephine (core of bone). He knew that would be normal but he still ordered it and it bloody hurt! Heart and lung function tests are very painless. Oh well, he is the doctor and I am the patient. I headed back downstairs for treatment. Renovations were underway in the day infusion ward so parts of it were blocked off and it was even more crowded than usual. The layout of the room had changed so that the naughty corner was now at the opposite end of the room. I was in the naughty corner again. I was informed that the renovations would be completed just in time for my last treatment, which was nice. Chemo was pretty uneventful. I had two lunches delivered; a hot lunch and the sandwiches, but I didn’t eat either of them as I wasn’t feeling well. The highlight of the day was a visit from Karine, my old chemo buddy who had finished her chemo way back on 23rd September when I was hooked up to round 5. She told me that she still wasn’t feeling normal but that people expected her to be absolutely fine because she’d finished chemo and she didn’t have cancer anymore. She’d been to see her doctor that day, who, I might add, is a female, and she told Karine she was doing too much. When I had seen the female doctor who was covering my haematologist when he was on holidays, around the time of my PET scan, she told me that I wouldn’t feel normal again until about 6 months after I finished chemo. I think everyone expects you to return to normal pretty quickly and as a patient, you probably expect it too. Obviously I will feel a hell of a lot better when I’m not being hit with chemo every two weeks, but it does sound like it will be a long road back to normality, not that I can remember what normal feels like. The week after round 10 was not too bad. I went to bed very early on the Monday as I was already feeling drained. I saw a story on TV that night, about a girl named Sarah, who was diagnosed with Hodgkin’s lymphoma in 2009, at the age of 28. Of course, she was told her prognosis was great, but four years later, after more types of chemotherapy than she can remember, 3 rounds of radiotherapy and 2 stem cell transplants, she still wasn’t cured or in remission. She had exhausted all conventional treatment options so her doctor had suggested Brentuximab, a new drug which has shown promising results in the treatment of Hodgkin’s lymphoma. I won’t go on too much, but this drug is not listed on the PBS and so it is very expensive. I decided then that getting Brentuximab on the PBS might be my next project after the walk to end women’s cancers. Was that just because I might need it one day? I spent Tuesday in bed but by Wednesday afternoon, I was able to drag myself out to take my daughter to her swimming lesson. I also dragged myself out of bed on Thursday morning, dry retching along the way, to take my daughter to school and do reading as it was the last day of reading for the year and I’d missed it the day before (I usually did Wednesday’s – which became fortnightly after chemo started). I even went to the shops on Thursday and was feeling quite good by Friday. My daughter had a school disco on Friday, with a Rubik’s cube theme. I had ordered her a costume to wear, from eBay. After I purchased it, I realised it was coming from England, so it arrived about 3 weeks after the disco. Yep, chemo brain. Saturday was a busy day, and I wasn’t feeling particularly energetic, with a 40th lunch (Karlene’s – daughter of The President) and then my daughter’s acting concert in the city. At the concert, was a lady who had coached me in netball over 20 years ago, and it had been about that long since I’d seen her. I spoke with her and she told me of a girl I played netball with all those years ago who had also been diagnosed with Hodgkin’s lymphoma, but that was a long time ago when she was about 18 years old. At the time, she was playing netball for England (and played in the Olympics) and the whole team shaved their heads to support her. Like Sarah, she too battled the disease for about 3 or 4 years, going in and out of remission, but in the end the outcome was good as she is alive and well today. In the space of a week, hearing about two young people with this ‘good cancer’ who lived with it for several years did make me wonder if that’s what I had to look forward to. Now family, don’t get all stressed thinking that I’m stressed and think that’s what’s going to happen. It was just interesting timing hearing these stories as I was approaching the end of my treatment. It’s a possibility but I’m not stressed. It’s probably one of the reasons I am happy to be approaching the end of chemo, but not excited, because I don’t really know when the end will be. The rest of the week was fairly uneventful, except for Friday. Whenever I went out, I was constantly being told, “You look well!”, and this was said with a tone of surprise in the voice. I’m not sure what people expected to see; a shrivelled up cancer patient? I would also hear stories about people who thought I looked well, but didn’t want to say anything in case it was the wrong thing to say. For the record, if you think I look well, you can tell me. It’s not the wrong thing to say. You can also tell me I look like crap if you think that is the case. The fact is, when I don’t feel well and probably don’t look well, I don’t go out. I’m in bed. So if I’m out, it’s because I’m feeling pretty well, unless it’s something I have to drag myself to. I think people are surprised because they know there are times I am not well but I’m only seen out and about when I am well, so maybe I should start posting photos of myself when I’m curled up in bed, just to prove that I really am unwell sometimes. So, Friday 13th December was the annual revue at my work. It is the prelude to the Christmas party where staff members gather and do various acts, usually trying to be funny, sometimes unsuccessfully. Pathologist participation is usually quite poor but this year my dear friend, Dr Yeliena Baber, stole the show by performing an act which ended with her having her head shaved, to support me. She raised over $3000 for ‘The Good Tittie Team’ in the process! Yeliena was understandably quite nervous about becoming a skinhead but I reassured her she would like it and her children would not be scared of her. As it turns out, I think she loves it, and the reactions she gets from people, and her children are very proud of her. Yeliena recently got a sleeve tattoo on her left arm (there’s quite possibly another name for them but I don’t know what it is, and I’m sure you know what I mean). She had shaved her head for me but I wasn’t prepared to get a tattoo so I donned the fake sleeve tattoo I had worn when I dressed as a punk for the trivia night in September. I never thought that would come in handy again so soon, and it was a nice cover for my PICC line. 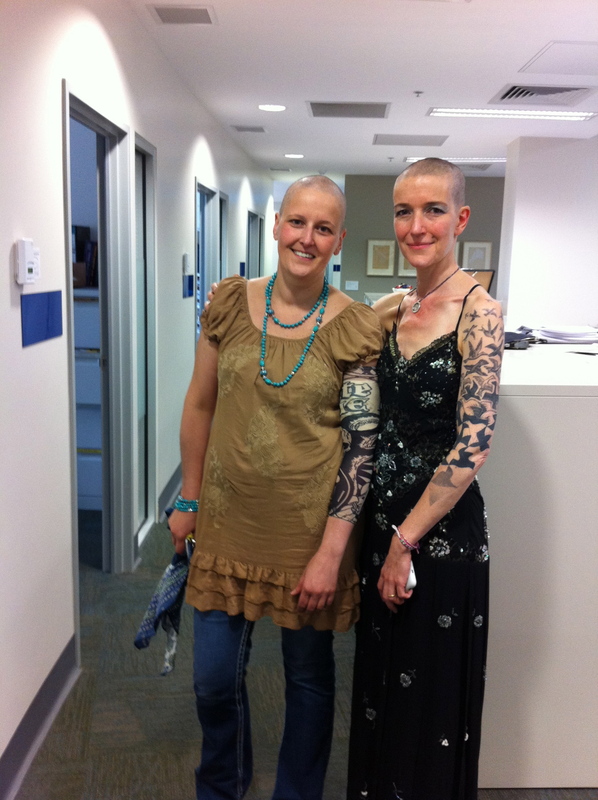 Two proud friends rocking a skin head……and a tattoo. I thought it was interesting at the Christmas party that followed, that Yeliena had her head exposed and I had mine covered with a scarf, and I had my “tattoo” exposed and she had hers covered with a jacket. I also found it interesting how different shaving your head makes you feel when you don’t have cancer as opposed to when you do. I think Yeliena felt brave, proud, empowered and generally good. And I’m glad she did! It was a huge thing to do (I was proud of her!) and I wouldn’t want her to have any negative feelings about it, but shaving your head when you have cancer just doesn’t conjure up the same feelings. In keeping with what I hope is a bit of an educational theme in this blog, I also need to tell you about something that somewhat pissed me off after the head shaving. Everyone thought what Yeliena did was amazing, including myself, but so many people felt the need to tell me they would NEVER shave their heads. I don’t think anyone with cancer would want or expect any of their friends so shave their heads (but would be truly humbled if they did) but I just don’t think it’s necessary to point out that you would NEVER do it. To these people I felt like saying, “just be grateful you have the choice and that you don’t have to endure all the other crap that comes with a diagnosis of cancer”. Also consider that your hair will start growing back immediately, unlike Lisey for example, who, by her own admission, resembles George Costanza almost one year after shaving her head and six months after finishing chemo. If you are one of the people who would never do it, why is that? Are you really that vain? Do you think I look ugly with no hair? As I said to Yeliena, I haven’t seen a bald woman who doesn’t look good. Given that one in three people will be diagnosed with cancer by the age of 85, you just might not have the choice one day, so why not give it a go when you are well and you can enjoy it? Jesus! This blog is a subtle reminder that although I see you or talk to you everyday, and think I know how you are feeling, I don’t! Mum & I knew about Sarah and her battle with Hodgkin’s lymphoma, we just didn’t realise you did too!! You certainly keep things close to your chest. I also didn’t realise how pissed off you were getting about the constant references of people NEVER shaving their head. I don’t think I’m in that category. I hope? Well, another great post. Count me in to help get that drug on the PBS!!! So you and Pam knew about Sarah and you didn’t say anything to me? Who’s keeping things close to their chests? I think you may have mentioned that you wouldn’t shave your head, but it’s OK, I understand how vain you are. I do think you’d enjoy having no hair however. I feel really smart each time I read your blog or maybe dumb as you explain things so well. Another great blog. Thanks for making it to Karlenes 40th. I know it was a rushed day.